Yellowknife is the capital city and the largest community of the Northwest Territories of Canada. Lookupfare brings you some of the best cheap flights to Yellowknife. Choose from numerous Yellowknife Flight Deals at the best discounted prices. Also, find some great deals on last minute flights to Yellowknife. Located by the northern shore of Great Slave Lake, Yellowknife offers some spectacular views of northern lights in fall and winter. It enjoys near about 24 hours of sunshine in summers and is famous for its exotic wilderness. 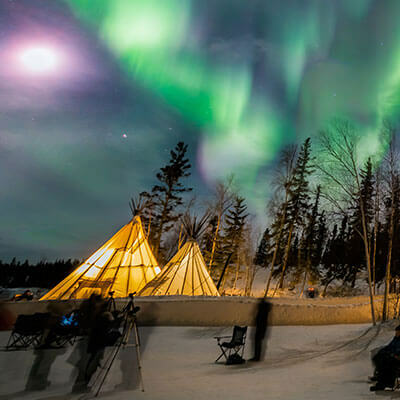 Northern Frontier Visitors Center – The ultimate visitor information for Yellowknife and surrounding communities. It is recommended to visit the center at the beginning of your trip as they council you on everything the city offers. Prince of Wales Northern Heritage Centre – The museum features exhibitions that tell stories about the people, land and history of NWT. It is also home to the NWT Archives, and also provides logistic, financial and technical support to organizations and individuals involved in cultural activities and the arts. Cameron River Falls Trail – This is one of the top spots for hiking in the city. Book some cheap airline tickets to Yellowknife and savor the scenic views of the waterfalls the trail offers. Bush Pilot's Monument - Located high on the "The Rock" in Old Town, this monumental attraction is dedicated to remembering the bush pilots and engineers who lost their lives in 1920’s and 30’s in the wilderness skies of the Northwest Territory. Aurora Village – One of the best spots for aurora viewing in warm and comfortable "Aurora Kotatsu" seats. It offers number of other activities as well such as sliding, dogsledding, snowshoeing, ice fishing, aboriginal craft lessons snowmobiling, aerial wildlife viewing tours, and much more. Lookupfare has formulated all deals and offers with the sole aim of providing you the best low-cost flights to Yellowknife. Go through our numerous deals and offers and book the best cheap plane tickets to Yellowknife. We also provide some amazing offers on round trip and one way flight deals.